My front entry has needed a bit of love for a while now! You know it’s bad when your 12 year old is making comments that the art that has been hanging there is really bad. I never really loved this artwork. It’s so impersonal and doesn’t say anything at all!! I’ve been finding that my style is changing too. I love a modern look with some iconic retro touches added in. I really had very little on the glass and chrome console table, which I found a number of years ago at a Restoration Hardware Outlet. The arrangement that was there was a live one for the party. 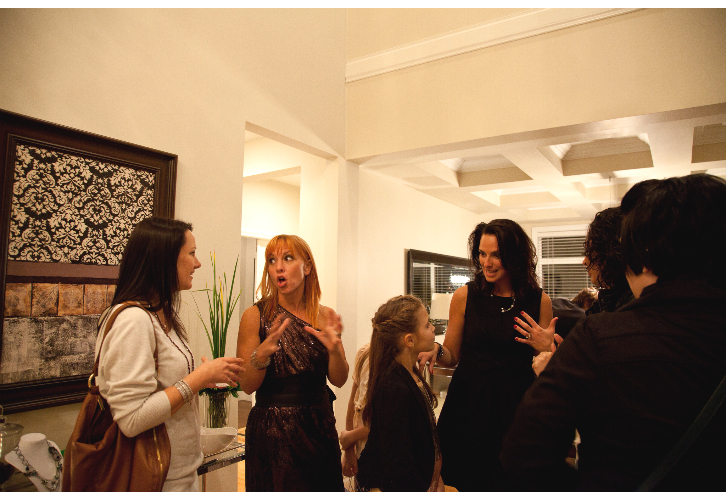 The console table is a classic design…so I knew I could mix it up with other pieces and it would work. If you are currently looking for a console table, I love this one from Z Gallerie or use this bar cart for double duty from Furbish Studio. 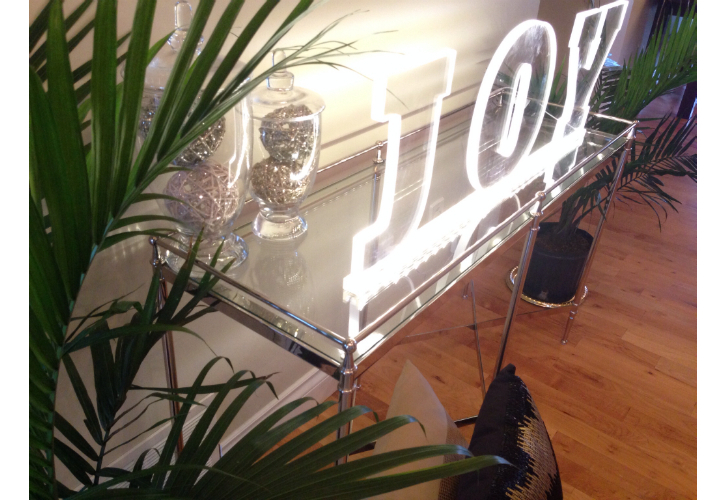 I custom designed this light-up lucite sign. 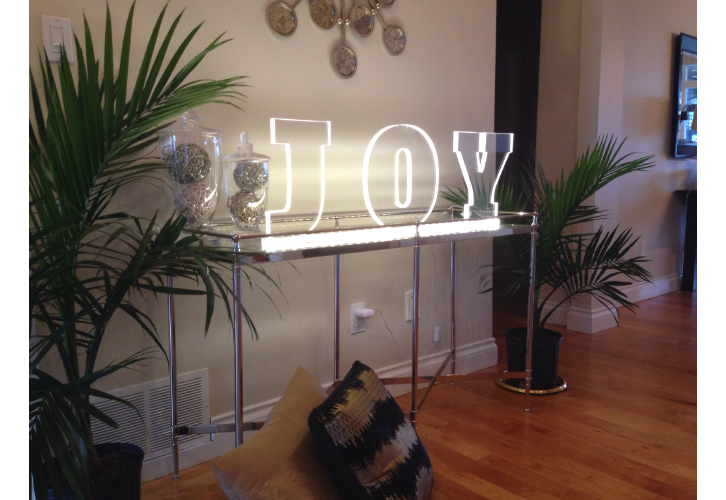 I had it made just before Christmas, so I went with the word “JOY” but it is a great reminder year round! It’s awesome because the letters are interchangeable. For Jason’s 40th birthday, I just used the “Y” and “O” and made it “YO”….kind of cheeky, hey? 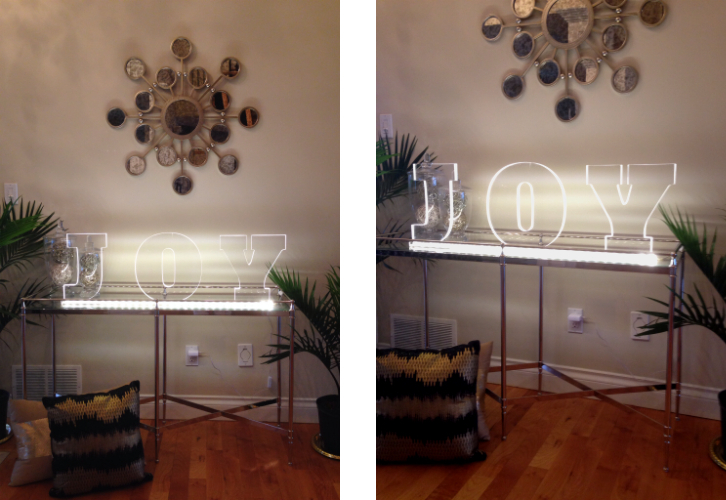 A friend suggested I get an “E” and a “S” made and it could say “YES”….I like it! I bought the tropicals for Jason’s party at Walmart last week on sale for $9.88 each….that was a seriously great buy!! I haven’t really had house plants for a number of years, but they are back and it’s really an inexpensive way to transform a space! I love the tropical feel they add, especially on our grey West Coast days! I considered a mirror for above the console table, but I have a long mirror in the dining room and it’s along the same wall, so I really needed something different. 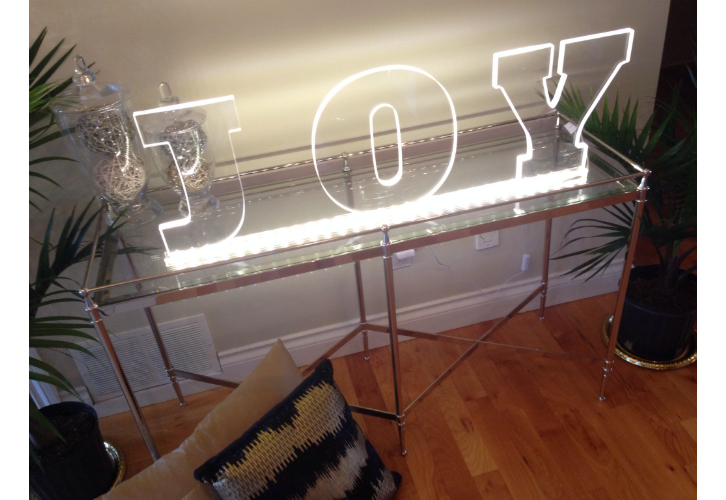 The mercury glass wall hanging was a clearance find at HomeSense as was the gold sequin pillow. The black and gold pillow was on sale at Target for $12.50. I really should have kept track of what I spent but I’ve been accumulating bits and pieces. With a little hunting and time on your side, you can transform a space for very little money. I definitely feel like my entry is now a much better reflection of me and our family and much more welcoming! Come on over and check it out!